What Mints produced the coin? 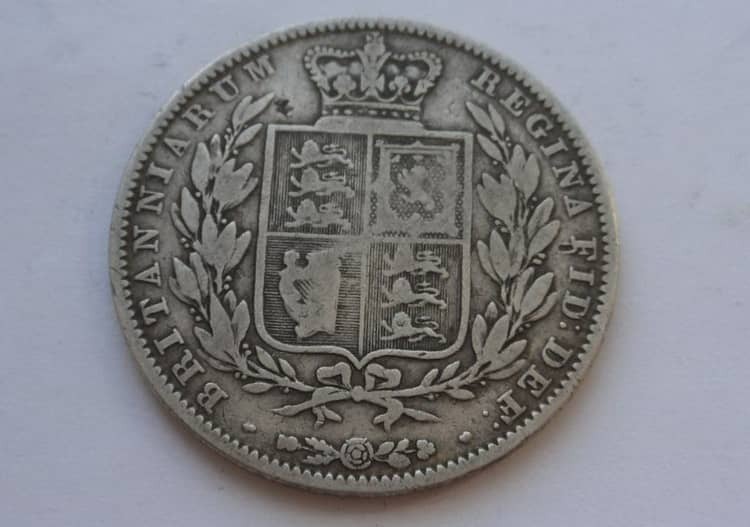 British silver coins of the royal coinage of the entire centuries-old period are represented by crowns, florins, pence, shillings and pounds. 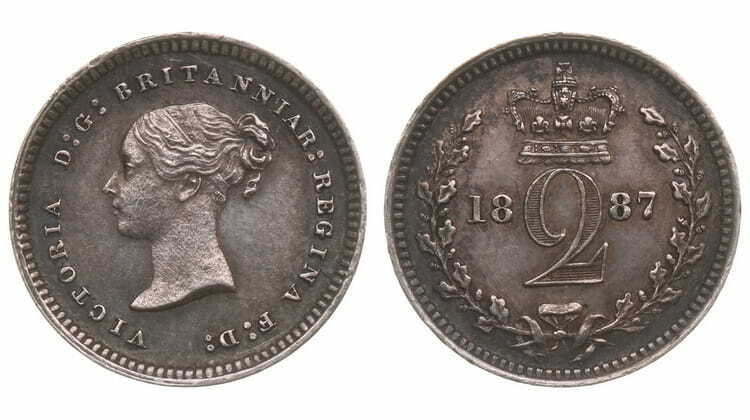 Each coin of this period reflects the era of government and the symbols of power of the head of state. 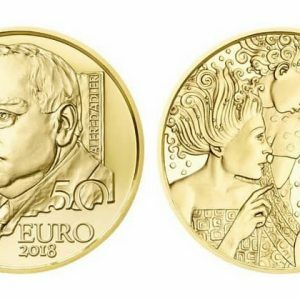 British gold coins of the royal coinage were in circulation along with the silver ones, and today coins made of these precious metals are considered as commemorative and investment. 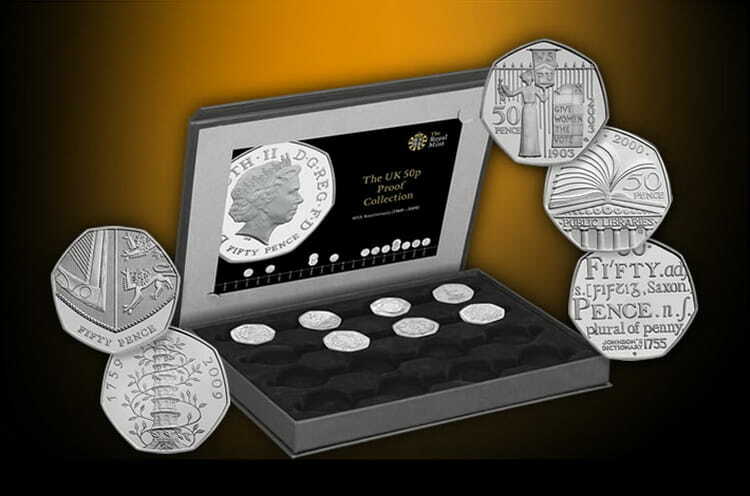 Silver Britain series is represented by nine types of coins, which in 1987 were combined into a set for the 25th anniversary of the series existence. 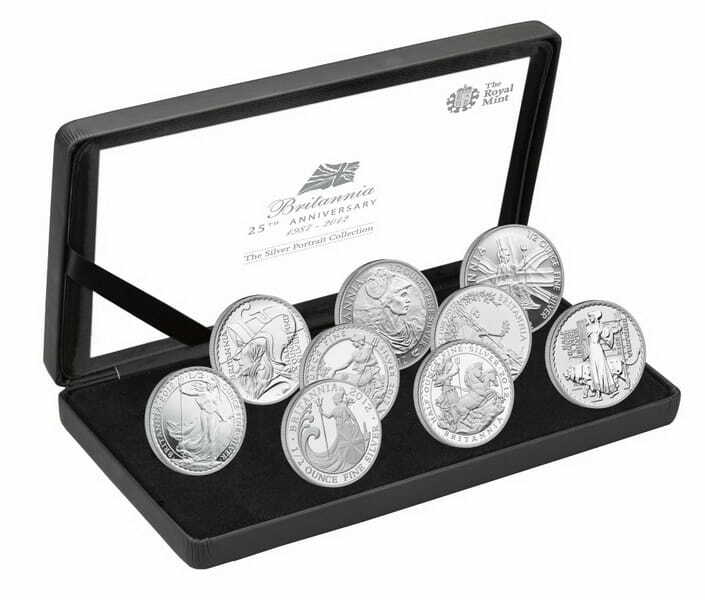 Each coin corresponds to 1/2 troy ounce of silver 958 and has 1 pound sterling denomination. 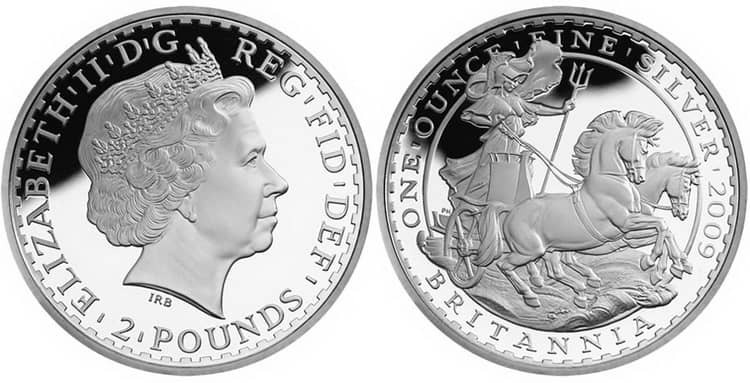 The obverse of each coin is decorated with the profile of Queen Elizabeth II, who developed the famous engraver Ian Rank-Broadley. Each such set has a certificate of authenticity and is issued in a circulation of 1612 samples. 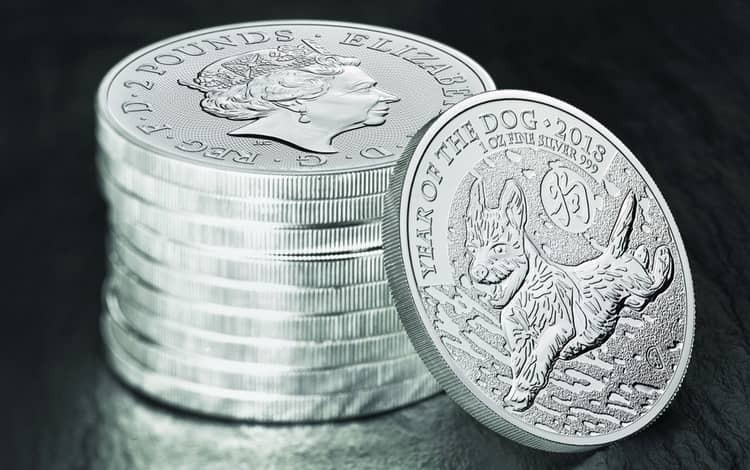 The Queen’s Beasts silver coin series with the image on the obverse of Queen’s Elizabeth II portrait has been minted since 2016. 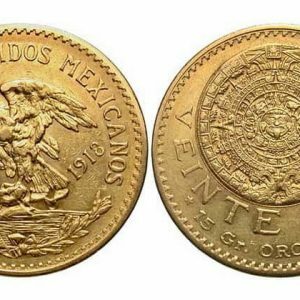 The series is represented by five types of coins in 5 pounds (2 troy ounces) and 10 pounds (5 or 10 troy ounces) denominations. 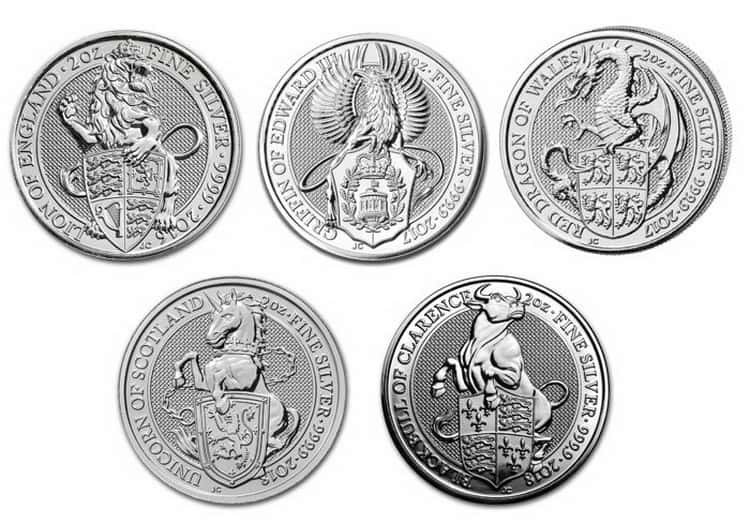 The coin’s reverse depicts animals corresponding to the heraldic emblems of Britain: The Lion of England, The Griffin of Edward III, The Red Dragon of Wales, The Unicorn of Scotland and The Black Bull of Clarence. Images of these animals were used in the design of the coronation ceremony of Elizabeth II in 1952. A “Lunar” series of silver British coins minted at the British Royal Mint in South Wales from 999 silver. This series is devoted to the zodiac signs of the Chinese horoscope by year and, accordingly, has 12 different types of coins of 2 and 10 pounds coins. 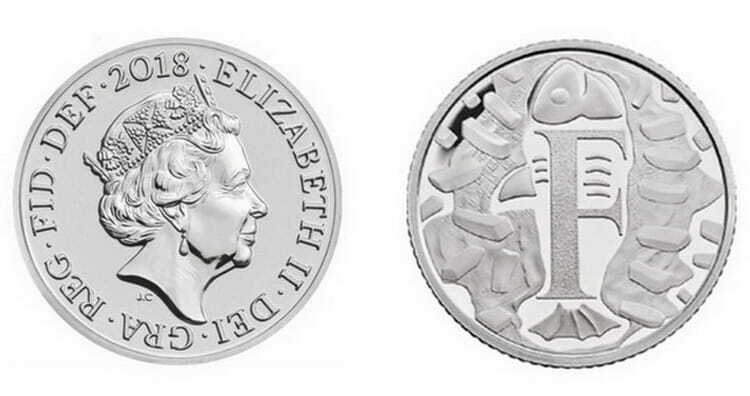 The obverse traditionally for British coins depicts the profile of Queen Elizabeth II, designed by Jody Clark. As for the images on the reverse, they were developed by the famous Chinese artist of British origin – Wuon Gin Ho. 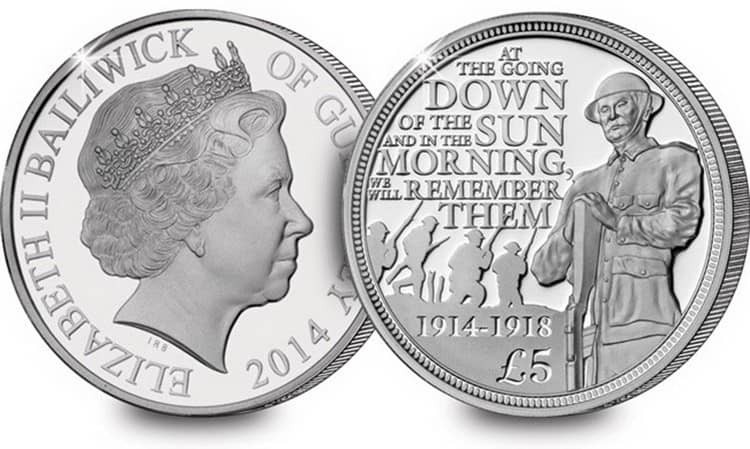 The Royal Mint is a department of the UK government, and its main responsibility is coinage for the United Kingdom. 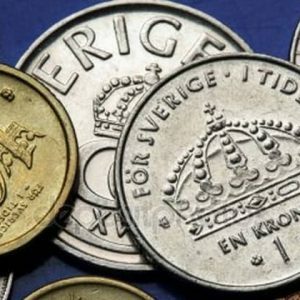 However, having a good reputation throughout the world, this Mint fulfills orders for coins production for more than 100 countries. The history of the Royal Mint dates back over 1100 years, so there is a natural connection between the scattered London workshops and the Tower Mint of London, from the specially built premises in Tower Hill to the huge modern coin factory in South Wales. 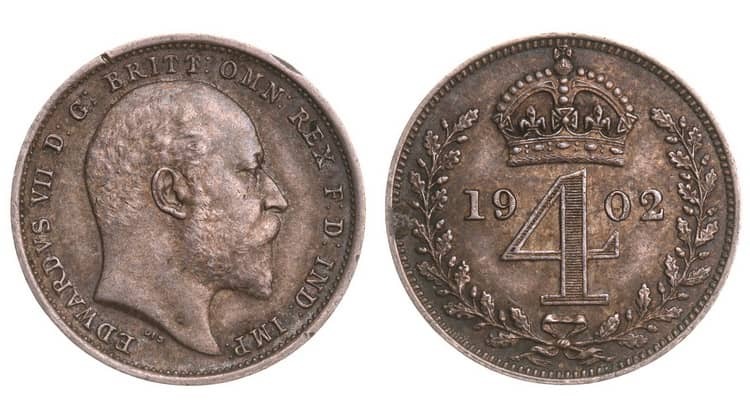 In April 1975, the Royal British Mint was reorganized into the Government Trade Fund, which is largely a state-owned company. 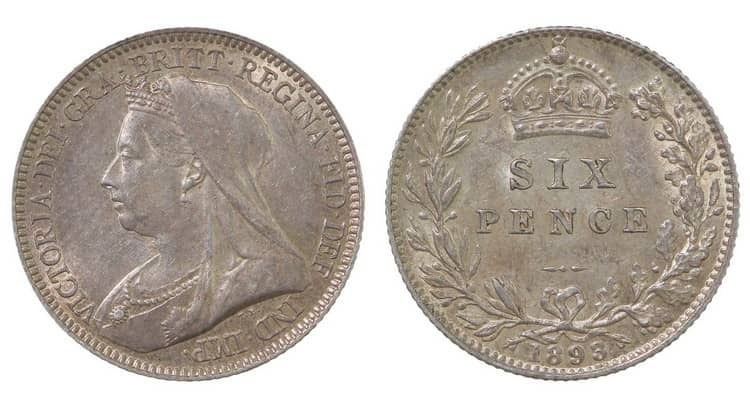 1 silver crown of 1889, which was minted during the reign of Queen Victoria, corresponds to 5 shillings of that period. Its weight is 1 troy ounce of silver 925 (28.28 g), and its diameter is 38.6 mm. 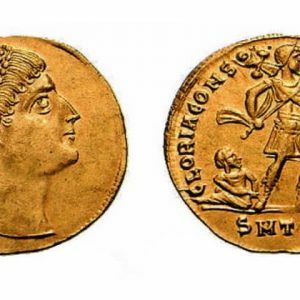 The cost of such a coin on numismatic exchanges can vary up to 35 $ USD. 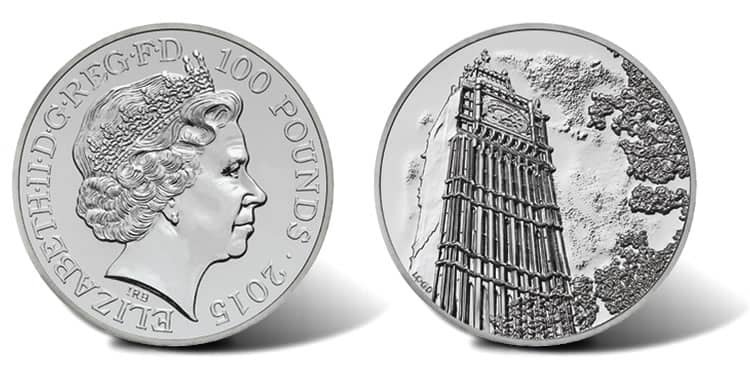 A 100-pound silver coin with the image of Big Ben was released in 2015 with a circulation of 50,000 samples, which was sold in record time − just 11 days. 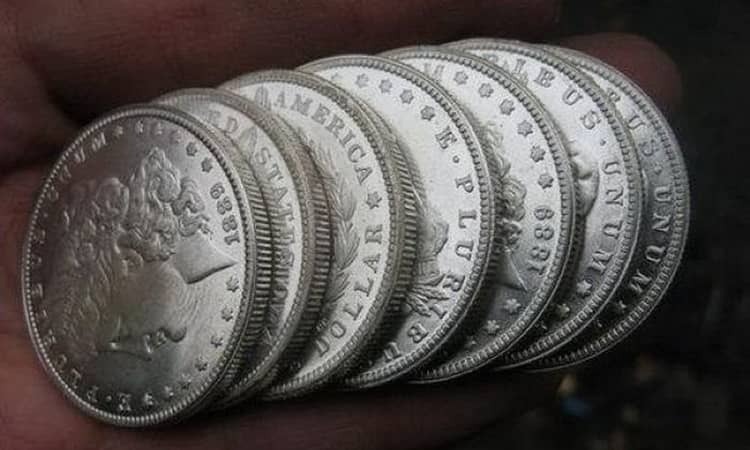 The weight of one such coin is 2 troy ounces of silver 999. 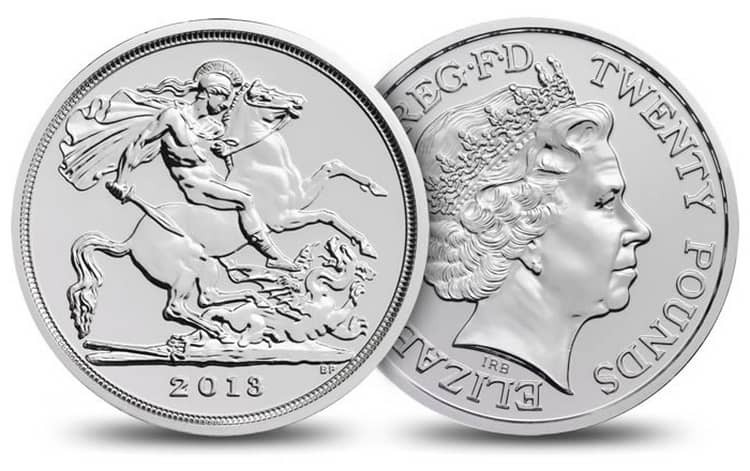 Thanks to the overwhelming success of this coin, during the next year of 2016, the Royal Mint of Great Britain released the same coin with the image of Buckingham Palace in the same denomination. Queen Victoria ruled the United Kingdom of Great Britain and Ireland from June 20, 1837, until her death. She was also the empress of India from May 1, 1876. Queen Victoria was the daughter of Edward the Duke of Kent, who was the fourth son of George III. Henry VIII of the Tudor dynasty was a King of England from April 22, 1509. He was the son and heir of Henry VII, the king of England and the second British monarch of the Tudor dynasty. 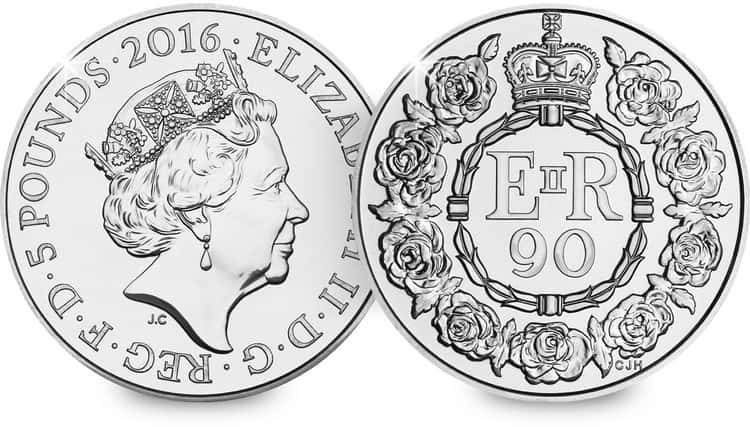 In 2016, in addition to the five-pound silver coin, 250 coins weighing 1 kg of 999 silver were issued for the ninety-year anniversary of the Queen. 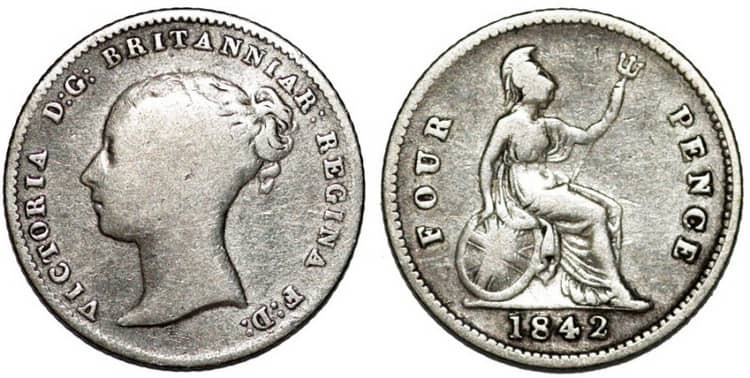 Nine roses, depicted on the reverse of the coins, are covered with the inscription “Full of honor and years”, which means “Years filled with honor”.